Thank you for stopping by to hear more about The Rogue Retrieval, my debut sci-fi novel with Harper Voyager. –J.C. Nelson, author of the Grimm Agency series. Book review in Galaxy’s Edge by Bill Fawcett and Jody Lynn Nye. 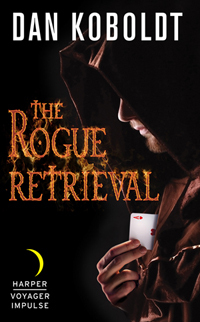 The Rogue Retrieval is available in print or e-book form at all major online bookstores. You can also order it from your local bookshop. It might take a few days, but they’ll get it for you (and appreciate your business). Get an autographed copy from Left Bank Books in St. Louis. This is my local independent bookshop, and they’ve been kind enough to stock some signed copies for online ordering. They ship anywhere in the U.S. for 99 cents. Buy it for your Kindle at Amazon. A good place to shop if you need… anything at all. Buy it for your Nook at Barnes & Noble. Come on, support the underdog! If you don’t have an e-reader, you can buy directly from the publisher and read it in their free app a smartphone, laptop, or tablet. Word of mouth is the most powerful way to help a book find its audience. If you liked the book, please tell your friends, families, co-workers, strangers at the bus stop… you get the idea. If they Google the book’s title, they’ll probably end up here. And you’ll have done me a great favor. Reviews on retailer sites like Amazon and Barnes & Noble are just so important. So are reader-oriented sites like Goodreads. If you like my book, please consider leaving a review or rating it at some of these places. See my guide to leaving book reviews if you’d like a little guidance. Please help me spread the word about my book by sharing this page on your social media platform of choice. Feel free to use the #RogueRetrieval hashtag. Here’s a fairly inclusive list of guest posts, interviews, reviews, and other media coverage for The Rogue Retrieval. Author feature in St. Louis and St. Charles community newspapers (February 3rd, 2016). Character feature in St. Louis Business Journal (February 26, 2016). Author event blurb by Jane Henderson in the St. Louis Post-Dispatch (March 5, 2016). Radio appearance: Max on Movies, on FM Newstalk 97.1 (and iTunes). March Fantasy Releases book blurb at Tor.com. One Mentor’s Journey guest post at Brenda Drake’s blog (February 3rd, 2016). Science and Fiction on the Beyond the Trope podcast. Pitching Contests on the Beyond the Trope podcast. Interview with Mur Lafferty on the I Should Be Writing podcast. 5 Books About Snarky Magicians guest post on Tor.com (March 3, 2016). Writing Standalones Sci-fi, at Michelle Hauck’s blog Michelle4laughs (January 26, 2016). I don’t have a Kindle or Nook. Can I still read your book? Yes, and you have a few options. You can download the free Kindle App and read e-books on your tablet, smart phone, or computer. Or, if you have an Apple device (iPod, iPad, iPhone, or Macbook) you can buy and read it through Apple iBooks. Or you can buy the paperback (see below). What if I prefer to read physical books? That’s easy: The Rogue Retrieval is now available in paperback. You can order it online at places like Amazon, Barnes & Noble, or Indiebound. Your local bookstore would also be to sell you a copy. It might take a day or two for them to stock it, but they’ll appreciate your business. So will I!